El Chiripero, Paradise by the Sea in the amazing Galicia. 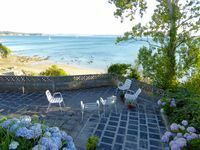 Property 6: El Chiripero, Paradise by the Sea in the amazing Galicia. Property 31: Rural cottage with charm, spacious, comfortable. Views of the forest and the stars. Property 34: Cozy & Quiet Apartment. Wifi & parking included. FIRST LINE OF BEACH. CHALET LOOKING AT THE SEA. DIRECT DOWN TO THE BEACH. Property 43: FIRST LINE OF BEACH. CHALET LOOKING AT THE SEA. DIRECT DOWN TO THE BEACH. Vacacionamos en este bellisimo lugar con dos de nuestros nietos, el sitio es expectacular, pero Jesus y Marixita lo hacen unico. Hemos rentado propiedades por muchos a&ntilde;os, pero nunca habiamos experimentado el trato que recibimos de Jesus y Marixita, la casa nos recibio con flores y atenciones, siempre estuvieron al pendiente de nuestras necesidades. La casa tiene acceso directo a la playa, practicamente playa privada. Volveremos y la hemos ya recomendado a amigos. The house itself has everything you need. But what really makes this place special is it's truly unique location. It's right on the beach. After descending some stairs you land on a small beach that is seperated by a few easy to mount stones to the bigger playa do Raso. This secludedness almost makes it sort of your own private beach. Something you won't find elsewhere easily!